Why is the Collared Dove a pest? When it comes to species of pest birds in the UK most people think immediately of seagulls and pigeons but Collared Doves are also known as a pest bird. Despite only arriving in the UK in the 1950s, the Collared Dove – also known as the Eurasian Collared Dove – has swiftly made its presence felt with there now being nearly one million pairs in the country. This comprehensive establishment has seen collared doves labelled as an invasive species having originated in Asia and now being prolific in many countries including the USA. Why are Collared Doves a problem? The main reason Collared Doves are seen as a pest species is that they carry disease – Trichomonas gallinae and Pigeon Paramyxovirus. These can be passed onto other species with Trichomonas gallinae causing birds respiratory problems that can lead to death in indigenous birds. The problem of the spread of disease is a serious concern for farmers, whose livestock can be put a risk through the risk of chickens becoming infected. 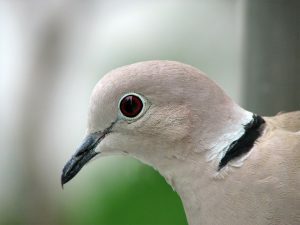 In addition collared doves are attracted to seeds and grains and will descend on farms and agricultural properties in large numbers to eat these. As well as decimating the drop, this is a serious concern regarding the spread of disease – particularly through droppings getting onto the crops. For householders the constant monotonous cooing of the collared dove is seen as irritating making it a nuisance bird, particularly due to its tendency to gather in numbers. If an agricultural property or farm is experiencing issues with collared doves there are a number of options that can be implemented to help keep the birds away. Spikes can deter them from landing and roosting, while netting makes a good choice to keep birds out of a certain area. Likewise for people finding Collared Doves a problem at home there are a number of solutions that can be put in place to act as a deterrent. If you are experiencing a problem with Collared Doves – or any other pest bird species – contact Total Bird Control for a solution that will work for you.